The structure of biocompatible nanocomposites formed by the action of laser radiation on an aqueous dispersion of albumin with carbon nanotubes has been studied by the high-resolution methods of atomic force and transmitting electron microscopy. It has been shown that the nanocomposites have a bulky structure consisting of conglomerates of nanotubes uniformly distributed in the albumin matrix. 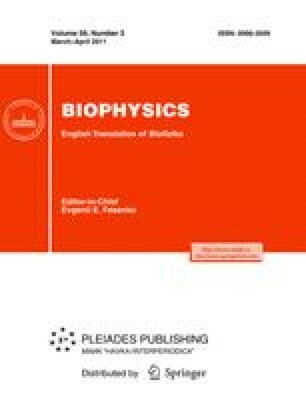 The results of the study may be useful in the production of filling nanomaterials for implants of biological tissues and organs and the control of their quality. Original Russian Text © I.I. Bobrinetskii, R.A. Morozov, V.M. Podgaetskii, M.M. Simunin, I.V. Yaminskii, 2011, published in Biofizika, 2011, Vol. 56, No. 2, pp. 212–218.